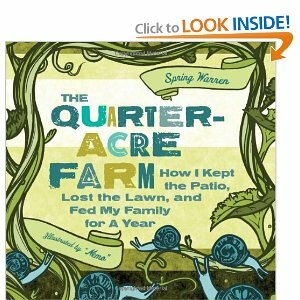 The Quarter Acre Farm: How I Kept the Patio, Lost the Lawn, and Fed My Family for a Year I enjoyed this book, not because I think it was particularly valuable as a how-to book (she lives in Southern California and we, well, don't) but more as a, keep your sense of humor book. I did learn some pretty valuable things from this book (mainly, that I don't think Geese are in our future if we ever expect to have visitors at The Farmstead) but unfortunately she doesn't go into a lot of detail. That's okay though, she's funny and her family is funny. When she talked about roaming around her gardens in her bathrobe I laughed out loud...I actually have an "outdoor bathrobe" that I switch into when going out to feed in the mornings. Even if you don't plan on turning your front lawn into a garden I suggest this book. It's one of those that you can put down and pick back up without having to rehash what happened right before. ps: if you click here it will link to Amazon where you can buy it, we don’t get anything if you purchase it, I just like when websites are helpful like that.